Beading Life - Beaded Jewelry Making! Making beaded jewelry is a fun and easy way to get creative for people of many ages. You can pursue beaded jewelry making as hobby, or sell your creations to other people and get money for something that is fun, easy and addictive to do! The goal when you being beaded jewelry making should be to create a stunning adornment for each and every outfit that you own. But why stop at just the one? Choice and variety are the key! Keep that it mind when you begin beaded jewelry making, as you will always be looking for a sneaky reason to start another project! Beaded jewelry making has stamped its place on many exotic cultures and countries across time. From the rosary beads of Christianity, to the peyote stitch of Native Americans, beads themselves have been in almost every society. 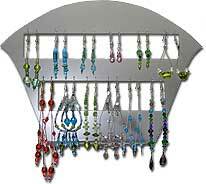 Beaded jewelry has had many uses - ranging from decoration, ceremony, currency to religion. Modern beaded jewelry making borrows traditions from Europe, the Far East, the Americas, Africa and prehistoric times to create exotic and attractive designs. You can see these influences in the types of beads produced. Be inspired to let this rich history shine through when you decide how best to display your beads. You can use several techniques in beaded jewelry making. The most popular for beginners use tiger-tail, beading thread or eye-pins. Each method offers a different way of displaying beautiful beads, and the maker should aim to use the technique that best enhances their exquisiteness. Tiger tail works best for displaying feature beads, as they can be held in particular places around a necklace, bracelet or on an earring drop. An easy method to master, tiger-tail designs offer beginners a quick way to begin their own jewelry collections. 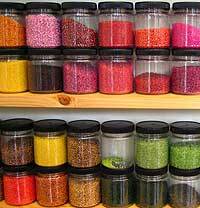 Beaded jewelry making using seed beads is best suited to beading thread. You can use a needle to create intricate patterns and weaves that can turn a small, common bead into something unique and different. Eye-pins are useful for beaded jewelry making. They can use either seed beads or feature beads to create long chains. These chains can become an earring drop, necklaces or bracelets of any length or size. Whatever technique you choose, the hardest part, at first, is starting! Once you have begun beaded jewelry making, however, you'll learn that the hardest part is actually stopping! It is a really addictive hobby that can be taken as far as you would like to go. In this site there is a virtual ton of great information, tips and advice to help you get started making absolutely gorgeous pieces of beaded jewelry! Here you will find detailed step-by-step instructions on making 8 gorgeous pieces of beaded jewelry - earrings, necklaces, broaches, bracelets and more! Did you know that e-books can be an invaluable tool for learning beading, gathering inspiration for new designs, and mastering advanced techniques? We review several popular beading e-books to find which ones can really help you with your beading projects! Learn the basics of beading or pick up a tip or two from the experts - Here you will find guides on all aspects beaded jewelry making; from how to size beads, history, jewelry styles, cleaning tips and more! Whether starting your first project or your fiftieth, here you will find invaluable tips and information on the many different types of beads, findings, tools and equipment you can use to create the perfect piece of jewelry! Stay informed with the Beaded Jewelry newsletter! Subscribe to the BeadingLife.com newsletter and keep up-to-date on the latest beading news! We regularly add new and useful tips, guides and resources to the site to help you keep improving and develop your beading skills. As a special bonus, newsletter subscribers are given priority access to all brand new beading projects as soon as they become available! Got something you want to say? If you have a great beading tip, article or idea that you want to share with other like-minded beaders, or if you have any comments or suggestions on how to improve this site, make sure to head over to the feedback page and let us know! query: INSERT INTO accesslog (title, path, url, hostname, uid, timestamp) values('Beading Life - Beaded Jewelry Making! ', 'node/12', '', '54.226.73.255', 0, 1556093521) in /home/surelion/public_html/drupal-4.6/includes/database.mysql.inc on line 66.